The belief in witchcraft is something that has existed for hundreds if not thousands of years, since the times of the Olmec and Maya of ancient Mesoamerica, long before European conquest and colonization. Terrifying legends of hideous monstrosities capable of sucking children’s souls away among other horrifying powers known as brujas - witches - have haunted the peoples of Mexico and continue to do so to this day. Controversial 2006 video footage has reignited the discussion, go Into The Portal and discover a world of witchcraft, sorcery and black magic in Central Mexico. Dated May 17, 2006, a video was received by a Monterrey television station. 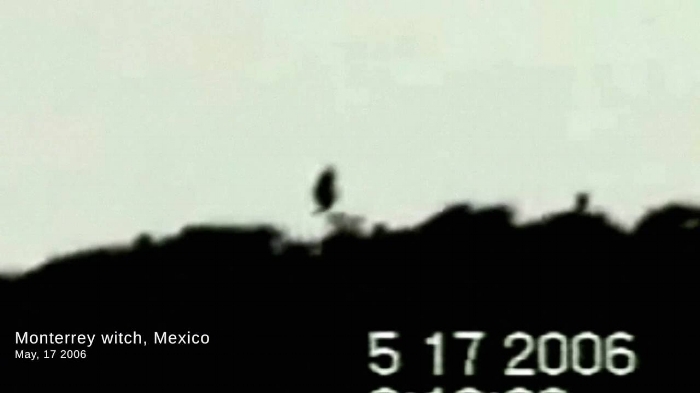 The controversial recording – which was allegedly filmed near Cerro de la Silla – shows a bizarre, dark object that is a humanoid in appearance moving through the air at considerable speed in a crouched like position. The object flies in a direct line, at first visible in the sky but soon drops below the skyline and is partially obscured by the background mountains in the film. The video circulated online and over the last 12 years has had considerable scrutiny. The conclusion however is mixed between those who believe it to be an outright hoax, along with the many other accounts and instances of potential witch sightings. And on the other side we have those who see it as yet another experience in a region known for Supernatural phenomena. Specifically, Witches. The footage was analyzed by many different experts and their conclusions have been mixed, although most believe it to be some kind of hoax or simply some “coincidental phenomena”… Interestingly, MUFON weighed in on the video, considering the object in question a UFO. "The experts say that there is no way something could move so steadily because it's a very windy canyon," stated Diana Perla Chapa, a researcher and UFO group leader from Monterrey, Mexico. No drones are capable unless of military grade, and the obtuse shape matches nothing on the known market, but is markedly human in appearance. It seems that the area of central Mexico, comprising the municipalities of Monterrey and Guadalupe in the province of Nuevo Leon marks the hotspot for the majority of sightings of and terrifying experiences with the dreaded Brujas. In 2004, two years before the controversial Monterrey footage was released, 21 year old police officer Leonardo Samaniego was on duty in his patrol car in the wee hours of January 16th, when he had an encounter with a petrifying creature that he would never forget. As the young officer was making a turn onto Amaro street he saw a dark object drop from a tree - not at a rapid rate, but almost floating erratically. The object hung in the air instead of landing on the ground, a dark swaying mass in the dead of a breezeless night. When Officer Samaniego shone his lights on the figure what he witnessed would scar him for the rest of his life. A horrifying dark Thing hung hunched over in the air, the bright lights caused it to slowly turn its head to look directly into the officers eyes, chilling him to his very core. Two sunken black pits of eyes glowed menacingly, gazing out from wads of frayed black hair and blackened, rotting skin. The creature donned what looked like a dark wide brim hat and a was draped in a ragged black tunic, and as soon as the lights came on it whirled on Samaniego and attacked his cruiser, flying towards him and violently hitting the front of the officer’s car. Panicked, Samaniego floored the vehicle in reverse. Out of his mind with fear, the horrible aberration continuing to attack the front of his vehicle, clawing furiously through the windshield glass. Samaniego managed to get a call to Police dispatcher Angelina Guerrero for some much needed backup as his car careened backwards down the street. The petrified officer lost control and crashed the cruiser into a nearby fence and, in an insane amount of fear, finally lost consciousness while covering his eyes to protect them from the horrible glare of the hag-like entity while it clawed at the glass, gnashing its hideously gnarled teeth in a vicious, unstoppable fury. When back-up arrived on the scene, it was assumed that some delinquent was the cause of the surprise attack, but no culprit ever turned up and no hoaxers assumed any responsibility…Samaniego was given both a drug test and a psychological assessment, both of which proved he was of sound mind that evening. The junior officer would later surmise that the demonic entity had not been able to break through the windshield of his cruiser due to the fact that he had an image of Our Lady of Guadalupe hanging from the rear view mirror. September 19, 2006 - a mere four months after the release of the Monterrey footage - Officer Gerardo Garza witnessed something terrifying that defied explanation in the mainstream world. Officer Garza was a seasoned officer in the force, with 5 years seniority he had a reputation on the line, one that he didn’t want to compromise. But what he saw that September night would stay with the officer for the rest of his life. Garza was on a routine patrol in a municipal graveyard when he encountered not one, but two entities that the man described clearly as witches, flying through the air in circles around a specific location amongst the crumbling headstones. "The witches flew off, but the police officers who came to my aid saw what I saw. They can attest to the fact that I didn't imagine anything. What I saw was real. I'd never been so scared before,"
Gerardo was subsequently taken to a local hospital with very low blood pressure. The officer was in complete shock, which was properpy documented and corroborated by first responders that took him to be looked at. So, what could Garza have seen? No doubt something that shook him to his core. The findings resulted in an investigation into the rural areas by the state authorities from the capital in Tlaxcala City. The issue became so extreme that it eventually led to a law being passed in 1954 by the state legislature requiring municipal authorities to report all causes of death marked chupado por la bruja to the medical authorities in the state capital for even further investigation. This response points to a serious belief in ‘vampire witch’, or tlaheulpuchi, lore in Mexico. According to traditional legends, once you are born a tlahuelpuchi, you remain that way and it has been said that it is a curse that neither god nor the devil can erase. 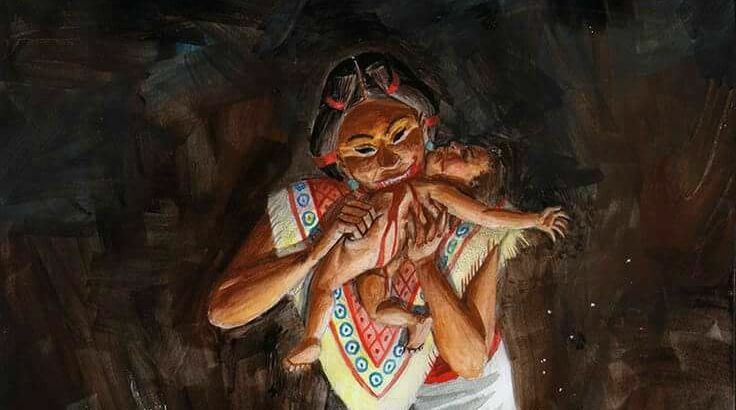 Much like the European vampire, the tlahuelpuchi needs human blood to survive - specifically, the blood of infants. One of the main powers of these vampire-witches is their abilities as shapeshifters, changing into a variety of different creatures to fit whatever situation they are in, much like a skinwalker. These vampire-witches can be killed but unfortunately the traditional MesoAmerican methods have become convoluted over time because of the influence and incorporation of European beliefs, and as it stands today, the wooden stake and cross are the weapons of choice. In a very similar trajectory as Europeans and New World Colonists, many women in Tlaxcala have been killed for being suspected tlahuelpuchis. The last known execution of a tlahuelpuchi occurred in 1973. In present day, the city of Catemaco has become the modern hub of witchcraft and sorcery in Central Mexico. Once a year there is a festival to honour the witches and warlocks that practice good magic, performing healing ceremonies and concocting juju cures for illness and maladies etc. The festival is known as the International Congress of Witches on the first Friday of every March. Allegedly, there is a cave nearby where the devil is known to visit… Each congress begins with a ceremonial 6-pointed star burning at the mouth of the cave as part of a ritualistic cleansing of auras known to participants as Black Mass. However, there is a darker side of Catemaco, where practitioners speak of recalling the devil to curse certain individuals, some condemned to death. Mexican witchcraft is a combo of African, old world Aztec/Maya, and European Christian traditions. Many Christian iconography and symbols are incorporated into magic practices in a very similar fashion to new world syncretic voodoo practices across the Caribbean islands and southern USA. Do you believe in witchcraft? Contact us at Intotheportalmailbox@gmail.com with your theories and encounters - we’d love to hear from you! Into The Portal is celebrating a special HALLOWEEN HORRORFEST MONTH - so go check us out on Apple Podcasts, Spotify and all your favourite podcast apps!